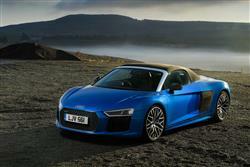 Find out everything you need to know on the new Audi R8 from independent vehicle review website Car And Driving. You can watch the video review to the left to see more of the car or read their written review below to get a true insight from an expert in the automotive industry. An Audi supercar was the last thing anyone would have expected back in the 80s and 90s when customers had the choice of only three Audi models and weren't buying any of them in any great numbers. Today, the Ingolstadt maker's range is vast and the R8's existence is taken for granted. Sharing many components with the Lamborghini Huracan, this model is as good a symbol as any of how far Audi has progressed and of all the R8 derivatives, it could be the Spyder convertible that best showcases the brand's all-conquering ambition. In second generation form, this car is less of a style statement and more dynamically adept, thanks to Audi Space Frame technology that makes it a far tauter driving tool. And it still looks as eye-catching as ever. As with the coupe R8, Spyder buyers get a mighty mid-mounted 5.2-litre FSI V10 normally aspirated engine with dual injection system, dynamic throttle response and a distinctive hard-edged soundtrack which can be amplified further by an optional sport exhaust system with gloss black tailpipe trims. There's a choice of two versions of this engine. The standard one delivers 540PS of power and 540Nm of torque, offering phenomenal performance, 62mph occupying just 3.6 seconds on the way to a top speed of 197mph. If you want to go even faster, the V10 plus model gives you 610PS and 560Nm of torque, enough to see 62mph achievable from rest in just 3.3s en route to a 203mph top speed. Older owners' toupees will need to be firmly tied down. Or at least they'll need to be if the fabric hood is open: it retracts in just 20 seconds and can be operated at speeds of up to 31mph. Behind the V10, there's a seven-speed S tronic transmission with lightning-fast action and power is distributed by a cleverly designed quattro drive system which distributes the torque to front or rear according to the driving situation - in extreme cases, up to 100 percent to the front or rear wheels. The dynamic handling owes much to the engine's low mounting position, which is achieved thanks to dry sump lubrication. The wheels are controlled by lightweight aluminium wishbones - a layout that reveals motorsport DNA. The electromechanical power steering provides feelsome road contact and can be supplemented with dynamic steering as an option. As ever, the R8 embodies Audi's wealth of expertise in ultra-lightweight design. The aluminium body of this Spyder with the Audi Space Frame (ASF) weighs just 208 kg, keeping total weight down to just 1,612kg. This design's elegant, lightweight fabric top, with its largely aluminium and magnesium linkage, perfectly complements this approach. What's more, torsional rigidity has increased by 50% compared with the previous model. The underbody has a smooth trim, to improve the aerodynamics. And at the rear, a large diffuser increases the downforce - two solutions taken directly from motorsport. The R8 Spyder V10 is almost entirely hand-built at the "Audi B?ellinger H?efe" purpose-made production plant near Neckarsulm. At the wheel, the standard Audi virtual cockpit presents all information in richly detailed, high-resolution 3D graphics on a 12.3-inch monitor. The driver can choose between three screens - the classic view, the infotainment view and the performance view. Owners taking to the racetrack will particularly appreciate the latter, which supplies data on torque, power output, oil and tyre temperatures, lap times and g-forces. The displays around the speedometer and rev counter can be customised to individual preferences. The sport seats for driver and passenger come as standard. Alternatively Audi can supply bucket seats for even better lateral support. You're going to need a budget of at least around £132,000 for your new R8 Spyder - or close to £150,000 if you want the 610PS 'plus' version. For that, you'd expect plenty of equipment and an exquisite finish - and you get it. The driver and passenger sit on sport seats or bucket seats with a more highly contoured seat shape than those in the previous model offered. Over and above the extensive standard equipment, customers have almost unlimited scope to tailor both the interior and exterior to their individual preferences. Body components such as the front spoiler, the diffuser and the new sideblades are also available in carbon. LED headlights with newly developed laser technology maximise visibility and range for the driver, bringing increased safety at night. Plus media connectivity has been prioritised. The Audi smartphone interface makes it possible to display selected content from your smartphone directly in the Audi virtual cockpit. The 'Audi phone box' option can also be specified to connect mobile phones to the car aerial and charge them inductively. In addition, there's the familiar 'Audi connect' media system that'll get your R8 Spyder on the Internet via LTE and provides a wide range of services - from online media streaming to real-time traffic information. The Bang & Olufsen Sound System is another highlight: For the first time, Audi integrates two head restraint loudspeakers into each seat, for an excellent audio experience even when driving with the hood open. Efficiency technologies such as the new freewheeling mode, in which the R8 coasts with the engine decoupled, have boosted fuel efficiency by 10% compared with the previous R8 Spyder. This MK2 model is capable of returning up to 24.1mpg, corresponding to 277g/km of CO2. With the 'plus' model, the figures are 22.6mpg and 292g/km. All these figures are aided by the 5.2-litre FSI engine's clever 'COD' 'Cylinder on Demand' technology. When one of the four upper gears is engaged, this shuts down the cylinders on either the left or the right bank of the engine. Which means that at low speeds when you're driving off-throttle, you'll probably be at the wheel of a V5 rather than a V10 R8. What else? Well, you'll be able to get your R8 serviced at any Audi dealership and there's a choice of fixed or flexible pre-paid plans, depending on whether you cover more or less than 10,000 miles a year. We're slightly disappointed by the three year 60,000 warranty though, particularly given that the mechanically-identical (and supposedly more temperamental) Lamborghini Huracan comes with a four year unlimited mileage package. The three year deal you get with equivalent McLaren and Porsche models is also unlimited mileage too. On to residuals. With only around 30 cars each day being hand-built at Audi's Neckarsulm factory, there's enough rarity value about this R8 to keep residuals buoyant.